Arduino Open Source Electronics Platform – What is it? You’ve probably noticed that quite a few posts on here talk about an Arduino, however we haven’t really gone into detail about what one is or where to get one from. An Arduino is an open source platform that is based on a microcontroller and an easy to use development environment for building electronic projects. The amount of uses for an Arduino is infinite, you use pins on the board to communicate with other hardware such as sensors, motors, lights, switches, and other circuits or systems. The development environment for the Arduino is also open source; the programming language is based on Wiring – The IDE is downloadable from the Arduino.cc website and is available for Windows, Linux and MAC OSx. So, how do I get an Arduino? You have a few choices here. The first one is if you’re familiar and comfortable with building circuits and have experience with electronics you can build your own. The Arduino is an open platform and there are plenty of guides available to build it from scratch. You can find a link to the Arduino Store here. Or a list of distributors here. There are many types of Arduino, the version you start with entirely depends on your experience and preference, or if you have a project in mind already, your requirements. So what versions of Arduino are there? This all depends on what you want to gain from it. 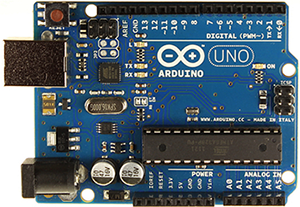 If you’re just starting out the Arduino Uno is a great product to begin with. This will allow you to get to grips with using an Arduino, there are also a good variety of shields available. If you have any experience with programming then that will be a huge advantage when working with the Arduino. Shields are extra boards that fit directly on top of the Arduino, some examples are of Ethernet Shields, Motor Drivers, Relay, Proto Shields, LCD Shields, Sensor Shields.. there are a lot. You can learn and download resources from hundreds of websites (this one included) but the best place for information is the Arduino.cc website and Forums. Check out the Getting Started Guide linked here if you’re a beginner, this will allow you to understand some basic concepts of the Arduino. There is much more to talk about, I haven’t even covered 1% of what the Arduino is and can be used for – Searching for Arduino projects into Google or Youtube will give you some idea of the vast array of uses for it. Or if you prefer to learn by reading then Amazon have a huge collection of electronics, microcontroller and Arduino specific books available. I hope that’s covered some of the questions people may have about our Arduino posts! There will certainly be more on here soon.